Trumble sent in SloMo to talk to Leigh. I AM NOT LISTENING. Funny how he won’t defend himself. Did you see the background on 7.5? There was this slowly rotating wheel with the outside panel with: Dutton – Morrison – Bishop – Abbott – Turnbull. Every news I have seen or heard calls Turnbull toast. A very strange beast – never seen before. I suggest the L/NP put on their life-jackets. The Labor states the government needs to implement the Neg made similar observations. The Victorian energy minister, Lily D’Ambrosio, said: “I’m not sure Malcolm Turnbull knows what the Neg is anymore – or it if still exists”. The ACT’s climate change minister, Shane Rattenbury, said the policy was done: “The Neg is dead. “It was hailed as a policy to address the trilemma of prices, reliability and emissions reduction. Instead, federal energy policy is being determined by the worst, climate change denying elements of the Liberal party. “White flag” will be Stumbles his political epitaph. Just the thought that Mr Dutton could be PM sometime this week is causing my mentally unwell daughter extreme agitation. This is a good read, covers many things including seat polls, and polling for The Greens in the last parliament. New Australian bill introduces some of the toughest legislation anywhere in the world for refusing to hand over personal data, while other Western countries are scrambling for their own solutions. On Friday, August 17, Duterte lashed out against the country’s sole treaty ally for what he sees as interference into how the Philippines decides where to purchase heavy defense equipment like submarines. “Why did you not stop the other countries in Asia? Bakit kami pinipiligan ninyo? (Why are you stopping us?) Who are you to warn us? Magbigay kayo ng submarino, mag implode ‘yun (You give us submarines, it will implode),” said Duterte during a Hugpong ng Pagbabago event in Davao City. He claimed that some US-donated helicopters were “used” and “refurbished” choppers from North Atlantic Treaty Organization (NATO). He said some were already “rusted” and their bad condition supposedly led to the deaths of some Filipino soldiers. Washington has made one of the gravest diplomatic errors of its many with Pakistan by suspending the US International Military Education and Training (IMET) programme. This doesn’t sound much, but it is probably the most serious setback in Pakistan-US relations thus far in the Trump regime’s fandangos of international incompetence. Been watching my control group discussing politics again. Très amusing. One of them suggested Cormann as the Liberals’ only viable option. Another was angry that Bishop isn’t challenging. Frydeberg’s name was tossed up as well. They are all very disappointed with Turnbull and none of them can stand Duttton. They’re all just discovering things that most political watchers have known for months or in some cases years. Anyway, the mood out there is definitely bleak for the Turnbull government. 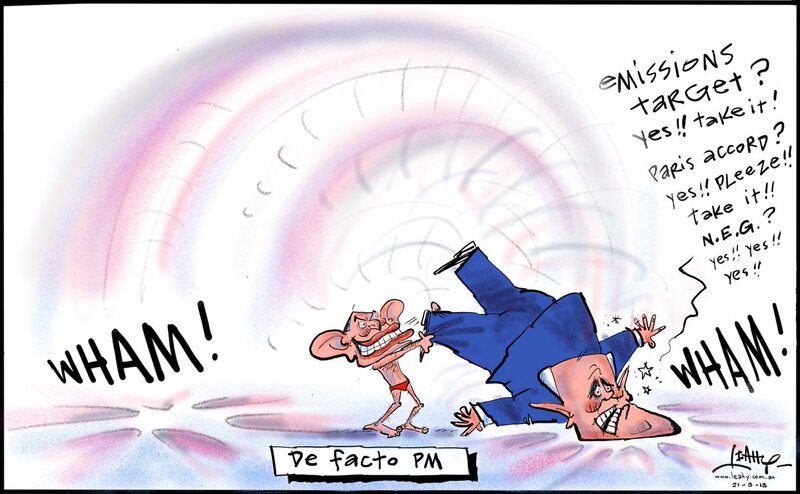 Possibly the most baffling thing about this past week is that for maybe two years plus the electorate has been telling the Liberals – in poll after poll – that they like Turnbull but don’t like the policies of the party. Like a big red sign flashing “BE PROGRESSIVE. BE PROGRESSIVE.” The warnings have been so gentle that Turnbull’s popularity descended with a drift rather than a plummet, as if the electorate were giving him plenty of last chances to turn his attitude around. And at the point where this has all come to a head and is threatening to take down Turnbull and in turn the entire Liberal Party, everyone there (including Turnbull) seems hell-bent on shackling him to the very worst of the Liberal agenda. They’re behaving as it it’s been the ideology and not Turnbull’s personal popularity that’s been keeping the party afloat. And the heir apparent is the poster boy for the most reprehensible of the policies. There’s a battle going on over there all right. Ideology vs political survival. And ideology is winning hands down. Never seen anything so stupid in politics. At least Howard had the sense to try appeasing us in his last days. The current mob would rather die in a ditch. Yes and yes. It probably won’t happen today………but they’re having their party room meeting at 9am according to the abc. Peter Hartcher now is of the opinion that it would take a miracle to save Turnbull. Eryk Bagshaw explains how the Turnbull government offered to exclude Australia’s big four banks from its company tax cuts in a last-minute pitch to gain the support of One Nation for the signature economic policy. But Hanson has rejected the approach. Mark Kenny examines the drivers and problems the Coalition is facing with respect to dumping Turnbull. 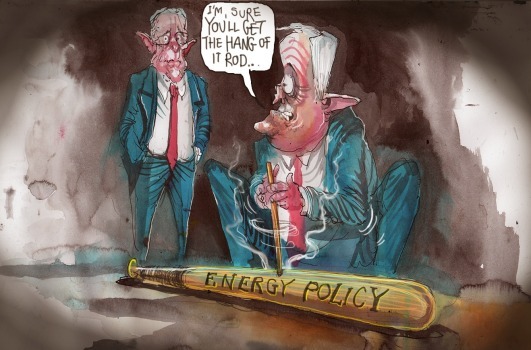 Phil Coorey reports that Turnbull’s capitulation on energy has failed to ease pressure on his leadership and close supporters of Peter Dutton claimed momentum was growing for a spill as early as this week. He reckons the Liberal Party is tearing itself to shreds over a policy that voters support. Catherine McGregor reckons Abbott is the Coalitions’ only hope. Jacqui Maley tells us how Abbott and his cronies have used the media to further their position. Katharine Murphy previews this morning’s party room meeting. She writes Turnbull’s decision to give in to his right wing enemies is disastrous for him – but also for the whole country and she refers to “Canberra’s deranged circus of wreckers”. Tony Wright says that Turnbull capitulated, leaving a band of rebels to ransack future climate policy. He says that in choosing his own survival over staring down those who were coming for him, even if it might have led to a fight to the finish that he could not win, Turnbull has handed over to his would-be assassins any power and authority he once had. Deepening leadership turmoil in the federal government and increasingly toxic debates around energy, immigration and tax have sparked renewed pleas for stability and certainty from business leaders. In an excoriating assessment of Turnbull the AFR’s Mathew Stevens says that just because you cannot do what you want and need to doesn’t mean you have to go out and do something that sits on the threatening side of unnecessarily daft. Erwin Jackson tells us how Turnbull just showed what happens when ideology and idiocy take charge of energy policy. Australian business is entering new and dangerous territory when the federal government holds out the prospect of breaking up companies that act against achieving favourable consumer energy prices. Gareth Hutchens reports on how Australia’s superannuation funds and business groups have reacted angrily to Malcolm Turnbull’s decision to dump emissions reduction targets from his national energy guarantee. The spectre of Peter Dutton as prime minister could cost the Coalition three marginal seats at the state election, Victorian Liberal insiders fear. Some in the Liberals’ Victorian branch have described as “toxic” to their prospects in the state. A change of leadership within the Coalition government could hurt the already-fragile housing market and the economy, if the country becomes less attractive to immigrants as a destination to settle. Progressives need to mobilise to combat the rise of the far-right in Australia, writes Ben Eltham. The time for complacency is over. Professor Anne Twomey examines the s44 issue facing Dutton. Very interesting . . .
Jackson Stiles says the constitutional crisis is perfect timing for Turnbull. Greg Jericho issues a warning that it may well be stagnant wages and employment growth that will become the main issue at the next federal election. A high profile doctor who secured a swing against the Liberal Party in the Coalition’s 2011 landslide win will run as an independent in next month’s byelection in Wagga Wagga. And he’s got the Libs quite nervous. The deputy chair of the ACCC has called for a change in the law to introduce a new general safety provision that would stop unsafe goods being sold in Australia. This would give consumers the same protections afforded to people across the European Union, Britain and Canada. When Australian parents shell out fees to send their children to private schools, they like to think they’re getting many things for their money. So they may be surprised to learn that superior student growth in literacy and numeracy is not one of them. From terra nullius to terra fullius, white Christians are taking over Australia, writes the Independent Australia’s Tess Lawrence. Trump will be forced to back down on tariffs on goods such as steel and aluminium because it will ultimately hurt his voters, Britain’s Investment Minister Graham Stuart says. Nassim Khadem reports. Trump continued to attack the former CIA director John Brennan yesterday, seemingly in response to the release of a remarkable open letter criticizing the president’s decision last week to revoke Brennan’s security clearance. Anna Patty writes on how truck drivers are in one of the unhealthiest and deadliest jobs in the country with a 13 times higher risk of dying at work than other Australians, a landmark study has found. Elizabeth Knight tells us how, when Woolworths held the line on plastic bags, Coles played dirty and successfully. Tax Office staff should prepare for a wave of hot-desking as their bosses ready plans to adopt the workplace fit-out craze at four more offices, a union has warned. Australian Taxation Office workers in Melbourne and Queensland can expect building renovations to bring layouts forcing them to look for a new desk each day, the Australian Services Union representing tax officials says. Deloitte valued the Sydney Opera House at $4.6 billion. That might be “replacement cost” if you had to raze it to the ground and begin again. But how do you value something which has lured millions of tourists to Australia over the years. With the Pope it’s all words but no action. And for today’s “Arseholes of the Week” nomination . . . 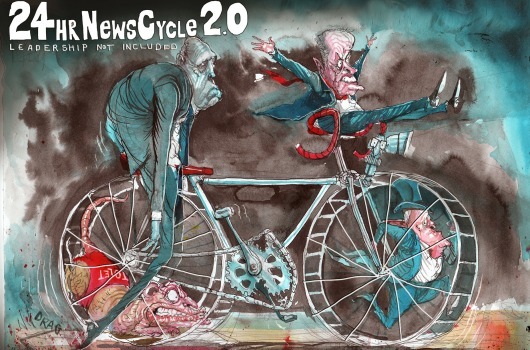 This one from David Rowe says it all about Canberra. Rowe introduces the details of the new energy policy. Two rippers from Sean Leahy. Paul Zanetti infers that it’s all over for Turnbull. 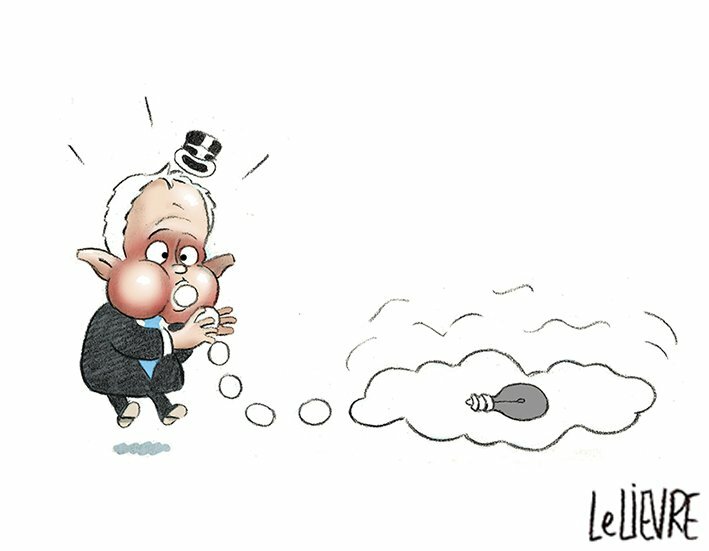 Glen Le Lievre thinks Turnbull is running out of ideas. Who is Mark Knight aiming at here? Andrews? Tradies? Shorten? Government regulators? David Pope has two beauties for us. Jon Kudelka reckons the emperor has no (NEG) clothes. Catherine McGregor, Tony Abbott’s close friend and adviser going back decades, says Abbott is the only hope for the government. In February this year Cate said she believed Tony had lost balance over Turnbull and “was consumed by that”, so she had given him advice on how to get his old job back . Tony ignored that and kept on offering “helpful” advice. It beggars belief that after a 35 year friendship, Catherine McGregor seems to have no idea of the real character flaws of her pal, Abbott. What on earth was she thinking? Bikie moll? Cat burglar? Straight from an audition for a part in the next Mad Max sequel? She seems to be missing a handbag ….. the spraytanned one she takes everywhere ……. What will happen to her? Still Deputy? Well that was over almost before it started. What now? Does Dutton resign from the ministry? Dutton sitting next to Abbott. The joy. I’m already celebrating. Waffles is not safe, there will be another challenge in as soon as a few weeks. The Geheime Staatspolizei want him gone. Dutton now has more time to shore up his support. Definitely another challenge, maybe before the end of the week. Those who want Turnbull gone will want it to happen before parliament goes off for three weeks. Deja vu all over again for Truffles. More fun on the way ? ………which Professor Williams has backed. But Williams says he doesn’t think that family trusts will protect MPs from the constitutional conflicts, given how the high court has been ruling. Which brings a whole heap more MPs into the section 44 quagmire. Now Turnbull has to manage a front bench reshuffle. It’s a real dilemma. Does he give one of the rebel nutters a spot in the hope it will calm things down, or does he appoint a moderate and stir up more trouble? No wonder he wanted Dutton to stay on. Politics 101. You don’t give just one person enough power to topple you. You give at least two people power so they will fight each other and not you. But how many new faces are there to reward? Turnbull has lost support from so many, and it will only take seven more votes to get him out. Turnbull has lost the support of more ministers than just Dutton. The talent pool for new faces is pretty much non-existent. Anyone remotely capable already has a spot. 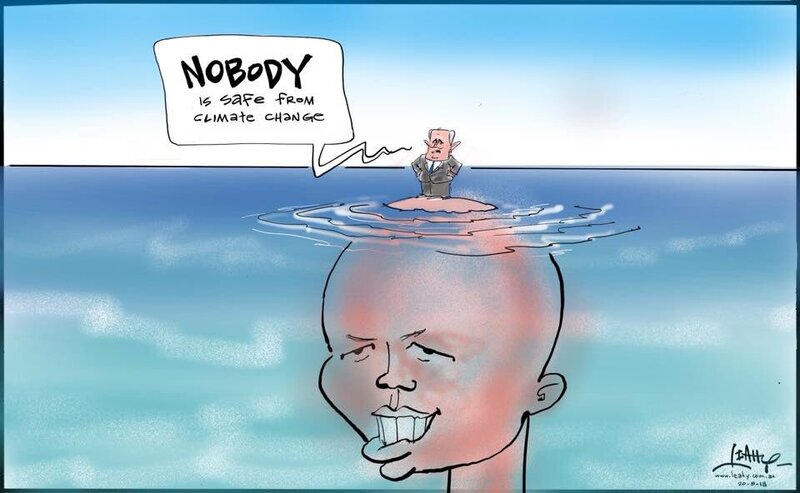 The bottom of the slippery slide, when the LNP has to rely on mostly racist Qld’s to save LNP seats. BREAKING I’m now told Turnbull is weighing up calling an election rather than risk another challenge. Ms Jayes a few minutes later said PMO says there will be no early election and he has not considered it. it’s the only way Turnbull can get out of this mess with a few shreds of dignity. It’s either call an election and lose gracefully (not that he’s good at being graceful, just remember his performance after almost losing in 2016) , or get booted out in the next spill. I hope Turnbull does go to Yarralumla tomorrow and call a snap election – with a bit of luck we’ll be saved from PM Dutton and bloody Abbott sliding into the Home Affairs or Defence portfolio. the ATO union is concerned about moves to get ATO workers to hot desk, like they do in industry, but promises 50 more desks than workers – unlike the ANZ head office. The workers are also concerned that they will be supplied with small desks. She was very careful not to talk about her work but would comment on ATO matters that had been aired in the press but i had occasion to watch her at work on our family’s affairs. Dutton says it’s all Bill Shorten’s fault. Bill made him do it. Just like it had always been “Gillard’s fault”. 😆 😆 😆 Just what he needs. Former deputy PM Barnaby Joyce has reportedly reached out to Mr Turnbull offering his “help”, according to Sky News. Dutton sure did mention Bill Shorten a lot. But he didn’t rule out another challenge. So I guess we can assume that attacking Shorten really is the only tactic the Liberals have. Nothing much about what they can do for the country or anything like that. Just Kill Bill talk. Can’t possibly see them finding their way out of the hole they’re in no matter who leads them. They have no actual plan for anything. None of them. Nice one Tanya. From Amy’s Live reporting..
Wow ! Check out the inner Lucien showing through in this snarly sneer as Shorten spoke. I assume this gives Turnbull two extra breathing spaces on the No Confidence motion. Bill Shorten’s motion of no confidence, for those (like me) who missed it live. Apparently it’s very easy to get a job if you are on Newstart, the government says so, it must be true. They insist anyone out of work is a bludger, a leaner, and must be punished for being lazy. So given that alleged ease of finding work I really don’t understand this whining. Recently PvO had another spat on Twitter. A couple of real live historians pick his argument into very small pieces. A good read. ……Thus, last week, Paul Murray complained that young people tempted by left-wing politics fail to understand that the Second World War was waged against socialism. Presumably by this he meant the Axis powers, Nazi Germany and Imperial Japan. ………….Peter van Onselen, leapt to his defence on Twitter late on 16 August. “There have been plenty of criticisms of Paul I’ve been reading on social media, pointing out Hitler was a fascist not a socialist,” he wrote, adding: “Nazism is national socialism which is considered a branch of socialism.” Claire Lehmann, founder of the Quillette magazine, fashionable blog of the right-wing commentariat, chimed in: “I thought everybody knew this already.” The Australian parallel universe was coming into view. Michael Sukkar has offered his resignation. Malcolm Turnbull is reportedly considering it. Just a reminder that a rush of resignations usually marks the second challenge. The media, especially Their ABC, have started on the Dutton PR campaign, all desperate to have us believe our future Fuhrer is a lovely, soft, kind-hearted family man who likes nothing better than cuddling refugee children, playing with his own kids and having huge, happy BBQs with his many, many close friends. Joseph Goebbels was shown as a devoted family man too, by Hitler’s propaganda people. There are plenty of pictures of him with his brood of six pretty, perfect Aryan kids and his older, blond step-son. 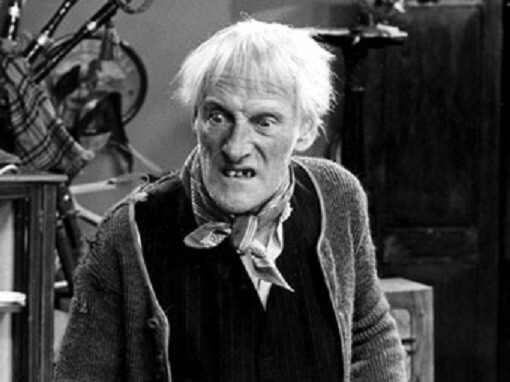 He loved those children so much he had his wife and a complaint dentist poison them all in Hitler’s bunker just before Soviet troops arrived in Berlin. I do not understand how, with all the writing on the wall, how he could not have got his wife and kids to safety. It has to come down to supreme arrogance. The excuse was the parents thought their children would be mistreated, if they were captured. Magda Goebbels had been considering poisoning them for some time. At least she had them knocked out with morphine by the dentist before shoving cyanide pills into their mouths. It’s an illustration of how insane all these top people were, back then. They had the resources to get their families to safety, but preferred what they thought was the glory of dying with their leader. It also shows us why fake media propaganda about creatures like Dutton being lovely family men is completely unbelievable. The mother, so much infatuated with Hitler and his Party, could not have her children live without this regime. It’s all beyond me. Was Dutton’s PR campaign the only reason this was allowed? Did not happen until this afternoon. Odd timing, isn’t it. Until today the boy was refusing to leave Nauru without his family and Dutton was insisting he either come alone or not at all. Now the boy and all his family are on their way. Probably too late to save the boy, but it will allow Dutton to try to look almost human for a few minutes worth of TV interviews. Quite a !!!!!!!! to read this in a Murdoch paper. It’s not because Waleed Aly is brown. It’s not even because he is Muslim. It is because he is all of the above and opinionated as well. ……..Unfortunately the facts couldn’t be corrected before the outrage industry had sparked a raging bonfire of ignorant indignation. Shane Warne thundered on Twitter that Aly was an “arrogant cretan (sic)”. You just make it too easy sometimes Shane. Mate, he isn’t a Cretan. He’s a Melburnian, born and bred. Like you. ……Neither Goodes or Waleed knows their place. They’re what you might call uppity. People love their indigenous players, but if those indigenous players dare to take a stand over past or present treatment of their countries they invite derision. Play the game, be grateful and shut your mouth…. They open their mouths and the lies flow out, and no-one ever challenges them.